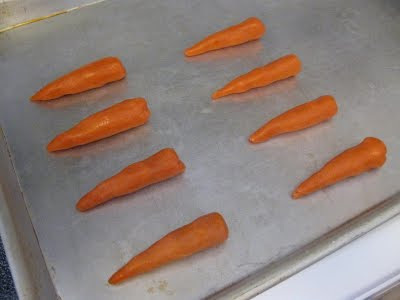 I am getting excited about this Thursday's Virtual Book Club for Kids featuring The Carrot Seed by Ruth Krauss. Will you be participating? Roll dough into small, thin, and long carrot-like rolls. Make them half the size you think they should be. Kind of like this. Bake them according to your sugar cookie dough directions until they have flattened and are starting to look solid on the edges. They should not be doughy. Let the cookies cool off a bit. Mix a few drops of food coloring with about a half a cup of water. Test out your "paint" colors until they are as bright as you would like. Paint the bottom portion of the cookies with orange and the top with green to look like stems. 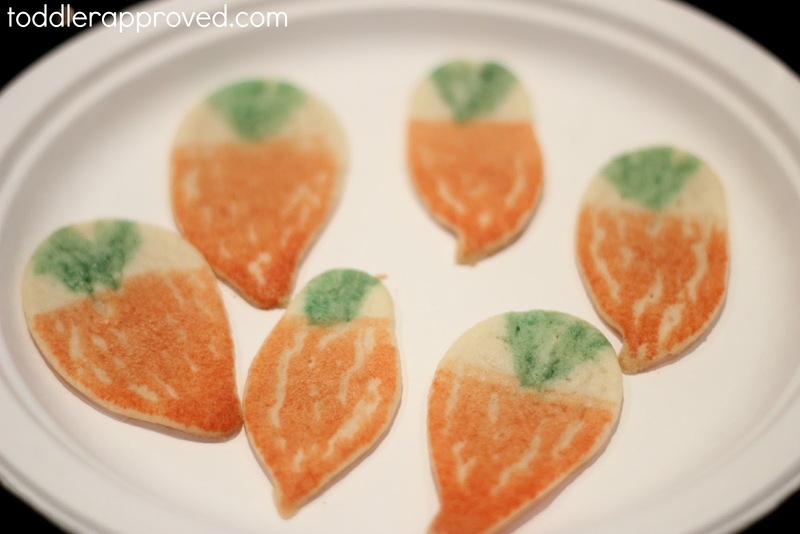 Have you ever painted cookies with your kids? My son was a big fan of this activity... and also loved trying to sneak sugar cookie dough. 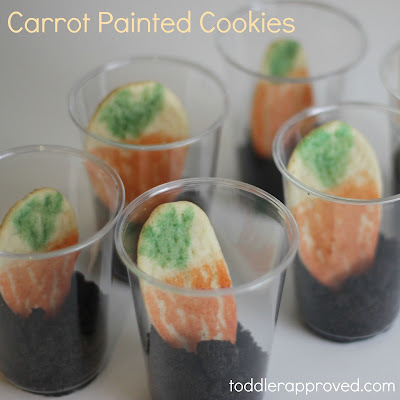 Once the cookies are complete, put some crushed "dirt" (oreo cookies) into a cup, dig a little hole for your carrot cookie, plant it, and pass out your yummy treat to your guests! My son helped me create these cookies before our book club... but next time I will just give each kid their own paint brush and let them paint their own cookies! It really was simple and fun... and so much better than trying to get the actual dough to change into the color we wanted... and easier than trying to cut the cookies into the shape we wanted too. I love simple and easy treats. This was definitely a great one! The kids thought it was so funny that they were eating dirt as well! I highly recommend adding it to your "to do" list this week! Make sure to stop back on Thursday (April 26th) to link up your Carrot Seed themed posts! I can't wait to see them! PS- You can check out all of the awesome posts from our March Virtual Book Club for Kids on our Virtual Book Cub pinboard. Do you have a recommendation of a book that we should pick for next month's book club? Comment or email us at toddlerapproved (at) gmail (dot) com with your suggestion! What a cute idea! They look so yummy. We're putting the finishing touches on our book club post...can't wait! I teach Pre-K and I just found your blog. I LOVE it! Thanks for sharing all these great ideas. These are so cute! JDaniel loves to eat dirt.